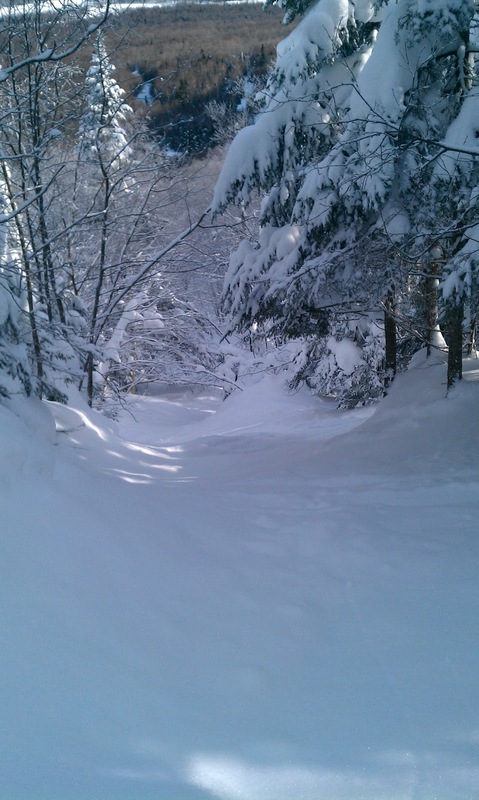 Jay Peak is one of those places that anyone who has ever skied on the East Coast knows about. 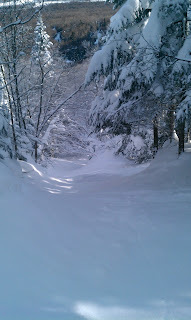 Its legend is made up of deep snow (a rarity in the East) and top quality glades skiing. I have been lucky enough to ski lots of great mountains over the years and I was surprised that I had never made the trek to Jay. Afterall, it is only about 4.5 hours from Ottawa. Needless to say, I was overjoyed when my girlfriend booked a long weekend there for us as a Christmas present. If you asked me to describe Jay Peak to somebody who had never skied there, I would say that Jay Peak is a place with one foot in the past and the other in the future. This is a good thing. The skiing is challenging, the lift lines aren't too long and the crowds on the hills are minimal. There isn't much by way of swanky lodges but I don't think you go to Jay to have a fancy lunch. You go there to ski the deep snow and we certainly weren't disappointed. There isn't much by way of a village at the base of the mountain. It could be hard for somebody who is used to the McVillages of Intrawest to imagine but it gives the place a unique character. There is the newly opened Tram Haus Lodge, where we were staying, some condos at little farther up the mountain and a construction site that will be home to the new conference centre and water park (set to open in 2012). The town of Jay is about 10 or 15 minutes away and there isn't much there but a place for some gas and some groceries. Every single member of the Jay Peak staff we interacted with was amazing. Everyone was super friendly and helpful. 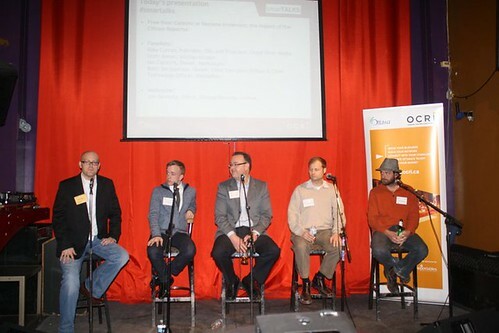 It was pretty easy to tell right away that everyone was there to make sure we had a great time. One of the coolest experiences was taking the tram up one day with Bill Stenger, who led a group of investors to buy the resort in 2008. Bill was super-friendly and took some time to share some tips on finding great snow with me. If I am going to travel for skiing, I like travel for deep snow. My reasoning is simple: if I wanted to ski groomed runs,I could do that at Camp Fortune, which is 15 minutes from Ottawa. We were lucky to get about 6 inches of snow or more each day so there was plenty of fresh snow to go around. This picture proves that. Sounds weird but I appreciated the fact that the Tram Haus had free wifi everywhere. I hate that hotels try and charge up to $15 for access when it should be complimentary. I also loved the new RFID system that makes your room key the same as you ski pass. You can use it to get into your locker to get your skis so you never even have to take it out of your pocket. I should also mention that Jay has a great website but they tend to underestimate the amount of show they get (which is good) and overestimate how warm it is going to be. 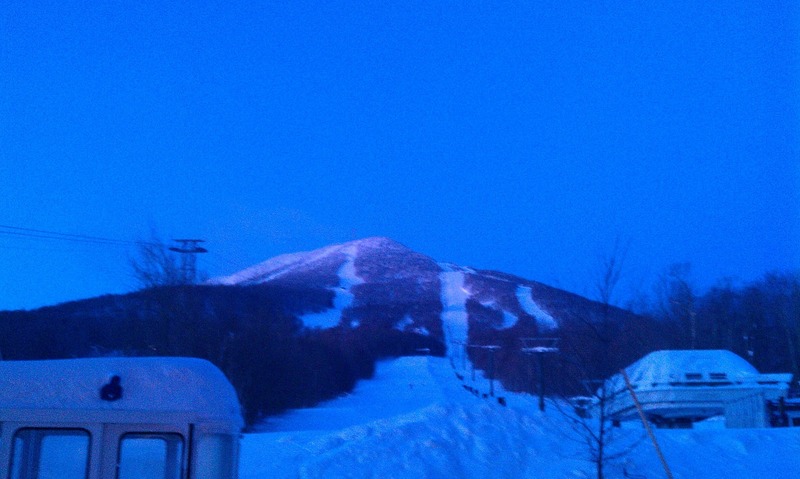 It is obvious that Jay Peak is in the middle of a massive upgrade. The new conference centre and water park will certainly help the mountain attract the corporate and family business that it needs to push forward. But don't let this fool you. Jay Peak is a skiers mountain and the locals are passionate. That's why their tagline is "Raised Jay". For people who like to ski, Jay Peak is a must-visit because when it comes to the skiing, it delivers. Last week I made a big switch from an iPhone 3GS to an HTC Desire HD that runs on Android 2.2. The decision to switch was brought on by the fact that I needed to replace my iPhone. I need a device that can function as my primary content creation device in terms of camera and video, manage my podcast subscriptions, hold and play lots of music and handle lots of social networking applications like Twitter, Foursquare and Facebook. A few years ago, I had an HTC Touch Diamond that was running the horror that was Microsoft Mobile Windows 6.5, or whatever it was called. At the time, the phone was somewhat marketed as an iPhone competitor but I have to say that it was terrible. I barely ever used Windows Mobile Office and it was confusing as to what was MSFT or HTC and what was Windows and what was the phone. Essentially the integration with HTC's Sense UI and Windows Mobile was terrible. Then Telus had a navigation application that didn't even work. I eventually upgraded to my iPhone 3GS and was instantly in love. Everything worked and the mobile browsing experience was amazing. My fat fingers could type and select content through the browser and although I am not a fan of the "closed" Apple experience, I appreciated that apps and podcasts were easy to find and sync. 1) Bad first experience are hard to overcome: sounds obvious but my previous experience which I have since learned were largely due to Windows Mobile 6.5 being a joke, really soured me on HTC. I know that they have started building great phones but I was really hesitant to go back down the HTC road. 2) Apple is winning the "ease of app" war: I like to keep my eyes and ears open to what is happening in mobile and I still found that my impressions of Android were tainted by the perception that whole application ecosystem was divided and not as convenient as iPhone. The reality is that there is an easy to use app "Market" and even better, people can email me apps and they are added to my phone in a matter of minutes. The Android app experience isn't much worse in reality but the perception is that it is. Anyways, I'm loving my phone so far and will keep you updated on how things progress.